As you can see there is one gold star with the possibility of six in total (because this is my first nomination). This entry was tagged Blog Awards, Blogging, postaday, Writer, Writing. Bookmark the permalink. congrats on the win!! I can’t seem to find the Facebook Group. Do you have a link so I can “like”? 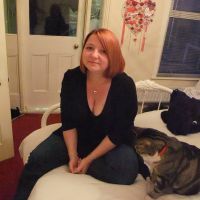 https://www.facebook.com/groups/BlogoftheYear/ That should get you to the Facebook page. Whoo Hoo! As my mom would say, this is a red letter week for me. Not sure what that means, but she says it when something good happens! Thanks Vikki and congrats to you! Congratulations on your award, Vikki – and thank you so much for passing it on to me! Im sure all of you will getting stars coming through thick and fast. I love everybody’s posts on here. Better sort mine out! Around the Med with fourteen handbags. I think I might just be doing it again! I warn you now, blogging is very addictive and takes up so much time…. But we all love it! Thanks honey, and thanks for stopping by! Congrats – you deserve many stars. You are SO good at helping us all find and read each other’s blog, plus you write a wonderful one yourself. Cheers and happy holidays!! Congrats and thank you for the nomination. Appreciate it and you. All the best this weekend. Hugs. Thanks Vikki, you are so kind! Now I have to figure out how to put this up and then give it right back to you. Busy, busy, busy! I really appreciate all of your support! Congrats babe! And thank you so much for the nomination! Thanks honey, you’re very welcome! Oh, looks like I did thank you. Disregard the extraneous thank you on your comment on my blog, haha. Or consider it very gratuitous of me. Your pick. 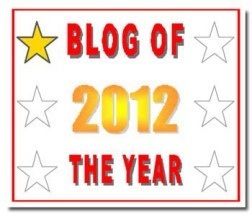 Congrats on Blog of the Year! Well of course I nominated you also. http://hunterswritings.wordpress.com/2012/12/17/blog-of-the-year-award/ Thanks for providing such insightful posts, and comments on my own blog over the year.